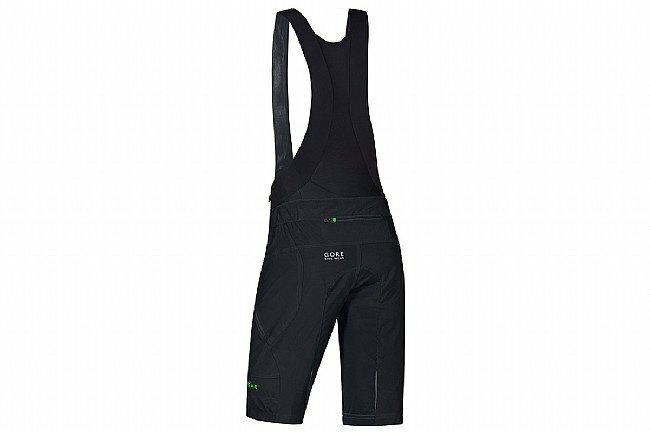 The Gore Bike Wear Men's Power Trail 2-in-1 Shorts combine bib uppers with a relaxed bottom to create the ultimate in comfort for mountain bike riders. You get the freedom of motion of baggy shorts and the secure fit of mesh bib straps up top. Inside, Gore's low-profile Power Trail Men's seat insert provides cushioning without the bulkiness of a road chamois to ensure uncompromised mobility while riding. These shorts are really nice and seem to be good quality. While the outer layer short isnt skin tight, theyre a lot tighter than most mtn bike shorts Ive owned. Having the chamois integrated with the exterior short in a bib style is great because the neither the inside layer nor outside short slide down as youre riding. I find the stitching on the chamois a little irritating on my inner thigh but not unbearable. The other drawback is that the outside shorts only have one front pocket, which is about 34 the way down. I like having lots of pockets and the first few times Ive used these shorts I find myself always reaching for pockets that dont exist. I find these shorts best for 2-3 hr rides, but they start to get uncomfortable for the longer rides in the saddle. Overall though they are pretty decent shorts.